To add Frazer to multiple computers, you will need to install Frazer Client on all secondary computers. This will allow you to share a single database on multiple computers on a shared network. 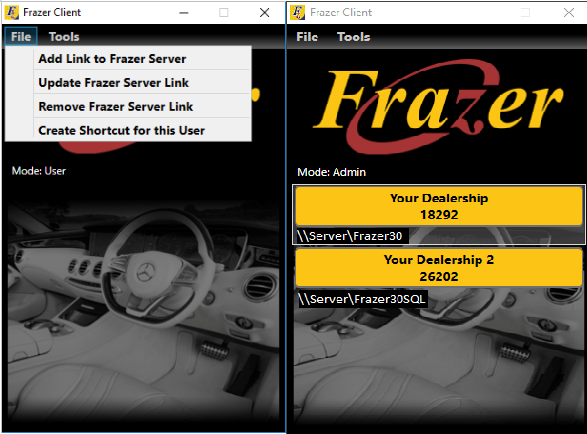 Functionality will be the same on any workstations running Frazer Client as the main Frazer system. Note: Updates and backups can only be run from the main Frazer computer and is disabled when using Frazer Client. ●A Windows PC running Windows 7, Windows 8 or Windows 10. First, share your Frazer system on your main computer (the system is normally stored in the “Frazer30” folder on the root of the “C:\” Drive). This main computer is where your Frazer database is stored. Your main computer will need to be powered on, properly shared and on the same network as your workstations for any secondary computers to be able to access Frazer. Each of these secondary computers will need to be running Frazer Client. After installing, Frazer Client will open and you will need to enter the path to your Frazer system on your main computer. The default install path for Frazer is C:\Frazer30, so you would enter \\pc-name\Frazer30 or you can click “Browse” to browse for the network path. For example, if your main computer is named “Autos-Server” in the network path field, you would need to enter \\Autos-Server\Frazer30. After entering the network path, click the “Verify Server Path” button. If the Frazer folder is shared properly over your network and you’ve entered the network path correctly, your dealership information will populate in the Company and Customer ID fields. You can now click OK and you will see a shortcut button has been added to your Frazer Client. Now that you have a shortcut set up on your client, you can click on the button to access your Frazer system. After the first run, clicking the Frazer Client shortcut on your desktop will bypass Frazer Client and launch Frazer. This will compare files that are on the main computer and your workstation. It will transfer any necessary files before opening Frazer. Open Frazer Client. If you have already set up one Frazer system, it will launch that Frazer system automatically. To bypass this, hold down CTRL on your keyboard and open Frazer Client. Click the “File” Menu, then choose “Add Link to Frazer Server”. Follow the steps above to add any additional Frazer systems. This will add a button on Frazer Client for the system you just added. Adding multiple buttons will disable the auto-launch feature. 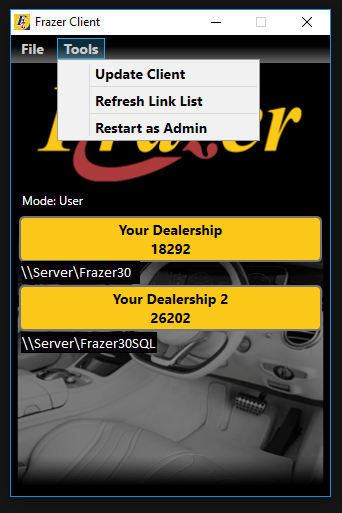 Frazer Client will automatically check for updates and apply them automatically when you open the program. If this does not work though, you can manually update by clicking on Update Client in the Tools Menu. For some unique setups, you may have multiple Frazer systems and want to exclusively use Frazer Client on all computers. You can do this by going to Add Link to Frazer Server in the File Menu. Now instead of adding a network path, you will be adding the local install path for Frazer (C:\Frazer30 by default.) When adding a local Frazer system, there will be no change in functionality from a normal Frazer install.